Weight Loss Buddy has been a premier weight loss support web site trusted by dieters since 2002. This carefully developed proprietary diet takes advantage of the latest scientific studies which prove that brief fasting periods, "intermittent fasting" do indeed have great health benefits. Individual results may vary. 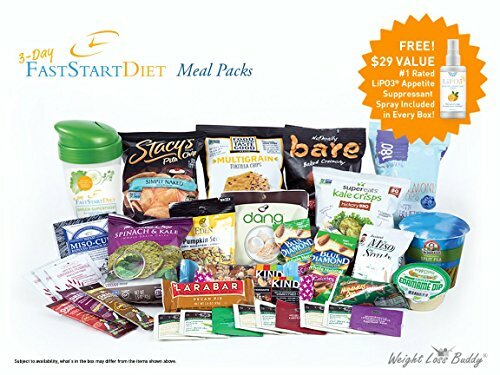 The 3-Day Fast Start Diet meal packs, were created to help you lose weight and establish a baseline from which you can continue eating healthy. Or as a periodic healthy tune-up. Our Guarantee: If you're not 100% fully satisfied, just return the unused portion for a full refund. The 3-Day Fast Start meal packs are part of a pre-measured, pre-calculated 3-day eating plan. We have gone to great lengths to carefully choose, out of hundreds of foods, nutrient ratios, (carbohydrates, proteins, and fats) that were found to be beneficial in recent longevity studies in "tricking" the body into thinking it's fasting. Intermittent Fasting has been proven to aid in weight loss and belly fat loss. It is also beneficial to heart health and cellular repair. Includes Appetite Suppressant Spray - An all-natural, organic, gluten-free, lactose-free spray that reduces cravings. It contains Garcinia, Green Tea Extract, and other natural appetite suppressants that utilize a powerful liposomal delivery system. 3 days of delicious and wholesome foods to satisfy hunger and at the same time trick your body into thinking that it's fasting. No bloating, sugar cravings or time consuming preparations. Boost metabolism and enhance hormone function to burn more calories while consuming less. If you have any questions about this product by Weight Loss Buddy, contact us by completing and submitting the form below. If you are looking for a specif part number, please include it with your message.